For other uses, see Corinthia (disambiguation). Not to be confused with Carinthia. The eastern coastlands of Corinthia are made up of pastures and farmlands where olives, grapes, tomatoes and vegetables are cultivated. The rest of Corinthia is mountainous. 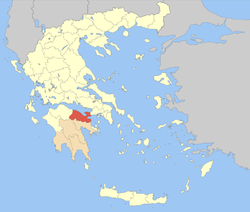 Its tallest mountain is Kyllini in its west and the largest lake is Lake Stymphalos, (important in greek mythology and a bird resort, protected by Natura 2000) situated in the southwest. The reservoir will become one of the largest lakes after its completion. This page was last edited on 22 February 2019, at 17:34 (UTC).